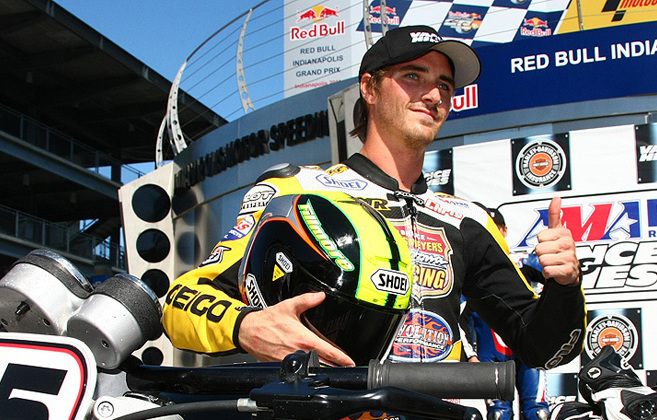 After suffering heartbreak in yesterday’s AMA Pro Vance & Hines XR1200 presented by Harley-Davidson Insurance Race 1. Chris Fillmore — who crashed out, and out of the points, after Jeremy McWilliams made contact — took his revenge on the field with a determined victory in Race 2. Finishing ahead of his closest championship rival, Steve Rapp, Fillmore crossed Indianapolis Motor Speedway’s famous Yard of Bricks with a margin of just .169 seconds after a race-long duel. Yesterday’s race winner, Tyler O’Hara, finished third. “My plan going in to yesterday was to kind of play it a little bit conservative,” said Bruce Rossmeyer Daytona Racing GEICO’s Fillmore, whose victory today allowed him to extend his lead over Rapp from three to twelve points. “After the crash I had on Friday, I wasn’t sure how I was going to be on the bike. Yesterday didn’t go as planed, so today I came in with a game plan of trying to throw down and pull away. Taking his second runner-up position in as many days, Parts Unlimited’s Rapp diced furiously with Fillmore and O’Hara through each lap of the ten-lap race. “I tried [to win] from the front yesterday,” said Rapp, “and the only thing different today was that I tried from second-place and it was the same result. Wearing a Gary Nixon tribute shirt over his leathers, yesterday’s winner, Tyler O’Hara, was once again a major factor in today’s race, leading the opening three laps and staying right in the thick of things throughout. “On the victory lap yesterday,” said O’Hara, “I was doing some burnouts and I messed up my clutch. It sounded really bad, but we got it fixed last night so I was happy to be out here on the grid today. The racing was just awesome from Lap 1,” O’Hara continued. Michael Barnes piloted the Drag Specialties XR1200 to his second fourth-place finish of the weekend, followed by Jeremy McWilliams (Harley-Davidson of Bloomington) and Canadian Harley-Davidson XR1200 Cup Champion, Steve Crevier (Motosports Plus/STS Racing). Latus Motors Racing’s Jason DiSalvo — yesterday’s third-place finisher — again worked his way into the lead group but suffered a Lap 6 mechanical heading down the front straight that forced him off the track. The incredible footpeg-dragging action of the AMA Pro Vance & Hines XR1200 presented by Harley-Davidson Insurance doubleheader aired within hours of Race 2’s finish, via a 6 p.m. ET broadcast on SPEED.